For investors, 2017 was a mirror image of 2016. The top performing types of American companies in 2016 were the biggest laggards in 2017. Meanwhile, the worst performing types of U.S. stocks in 2016 were the biggest winners in 2017. The orderly rotation of the leaders and laggards vividly illustrates how Modern Portfolio Theory worked in the real world last year. Modern Portfolio Theory is a large body of knowledge based on 70 years of research by investment academics. It's a framework for how investing is now taught in the world's best business schools and long embraced by institutional investors. Basically, classifying investments based on their statistical characteristics imposes a discipline for managing assets based on history and fundamental facts about the economy. Of course, human judgment based on a good sense of history is critical in applying the theory to people in the real world. And all this doesn't guarantee success. It's a theory. But it is the best solution spawned of the research by several generations of the world's best minds for increasing the likelihood of investment success, and it is the framework for investing that this firm believes in. Applying portfolio theory at the end of 2016 meant lightening up proportionately on the most-appreciated types of assets - small-cap value stocks - and buying more of the types of assets that lagged, the S&P 500 large-cap growth stocks. The exact amount of each type of asset is set based on your personal preferences and appetite for risk. Usually, when you look at the returns of asset classes from one calendar year to the next, the performance seems random - there is no order to what occurred. The orderly reversal of leaders and laggards from 2016 to 2017 vividly illustrates a key concept in managing wealth prudently. In real-world 2017, then, the theory worked exactly the way it's supposed to - it was uncanny. Global stock market returns in 2017 versus 2016 reflected a similar mirror image. Although the seven types of U.S. and foreign stocks did not prove the theory quite as perfectly, the biggest winners of 2016, small-cap U.S. stocks, were the biggest laggards of 2017, and the biggest laggards of 2016 were the biggest leaders of 2017. The real world of investing in 2018 is filled with uncertainty. Tax reform could accelerate economic growth and prompt the Federal Reserve to make a policy mistake by squelching growth or allowing the economy to overheat and inflation to surge. The political scandal in Washington could devolve into a constitutional crisis or the nuclear standoff with North Korea could erupt with terrifying consequences. 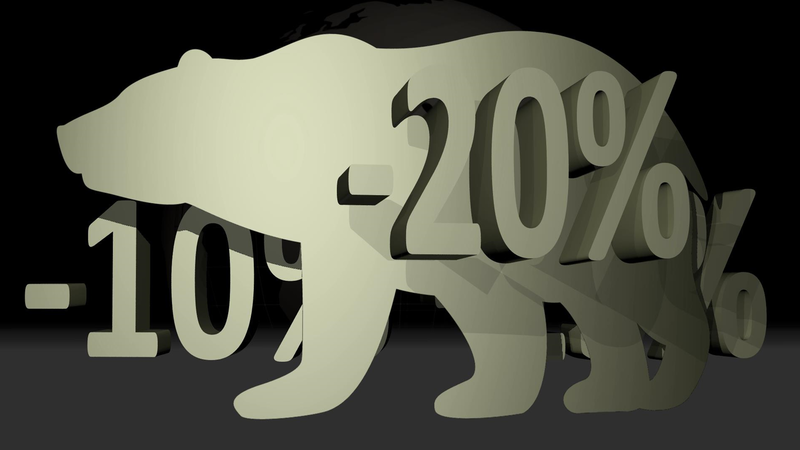 A 10% or 15% drop could occur at any time on bad news and the chance of a bear market decline of 20% or more increases as the eight-and-a-half-year bull market grows older. On the other hand, the bull market could continue in 2018 and beyond, and prices could head much higher. The economy shows no sign of slipping into a recession; leading indicators signal a strong start to 2018; the world economy is growing in synchronicity with the U.S. - the first time that's happened in many years; and the new tax law is expected to boost earnings sharply and that's what drives stock prices. 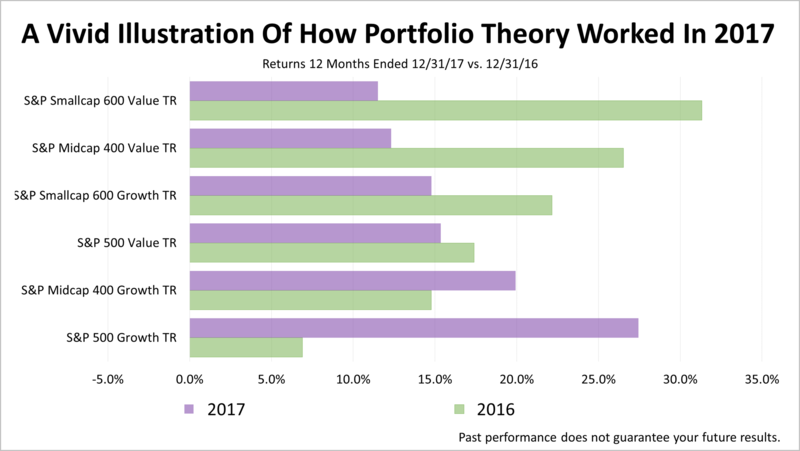 You can't be sure what the future holds, but seeing how well portfolio theory worked in the real world in 2017 may give you comfort and boost your confidence to stay committed to a program of long-term wealth management and financial planning.